If you are joining a Projects Abroad group trip you are in for the trip of a lifetime! With Projects Abroad you and your group will get a great opportunity to live a very different style of life and see a totally different part of the world. You will be working with local staff on the ground and experiencing the developing world. How to arrange a group trip? If you and your friends want to go away as a group you can organise it with Projects Abroad. All you need to do is to choose where you want to go and what you want to do. Projects Abroad will do the rest! To help you to choose a project give us a call on 01903 708316 or email us on groups@projects-abroad.co.uk. What will Projects Abroad organise? Projects Abroad will organise a bespoke itinerary with you and your group. This will combine project work, your accommodation, insurance as well as your evening and weekend activities. Projects are typically a combination of some community work mixed in with some tourist activities. You have to pay a placement fee to join the trip. The prices are outlined at /prices/. Once you have paid to join a programme you will not need much additional money for your trip. Most groups use fundraising to help to raise the money. Projects Abroad can advise your group on ways to fundraise. How can it help my CV? Most trips are a combination of activities. The trip can be directly related to your career plans with medical and teaching programmes popular with groups or it could be a community project or learning a language. Even if the project is not directly related to your studies you will find lots of material to add to your personal statement on your UCAS form or to talk about in an interview after your return home. We have projects in 29 countries worldwide. We are mainly based in developing countries throughout Africa, Asia, Latin America and Eastern Europe. The destinations available to you are outlined at /destinations/. You can join a broad range of different projects such as community projects helping out in local schools or orphanages to medical programmes getting experience working with local doctors and nurses across the world. To find out the range of options look at /groups/school-groups/. The projects are tailored to your group so if you have a project that is not mentioned on our website you can email us at groups@projects-abroad.co.uk to see if it is possible. Groups can range from 5 friends travelling together to a group of 50 students travelling with their teachers. If there are less than 5 of you why not check out our sister website www.projects-abroad.co.uk which caters for individual volunteers and small groups. How long are the trips? The trips range for anything from a week to three months. We would recommend for you to join a trip for at least a couple of weeks. 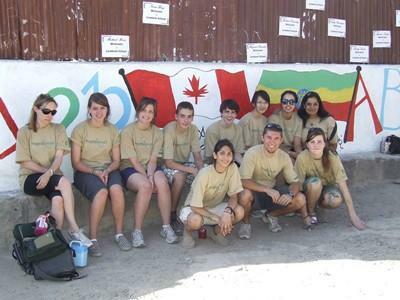 What are the benefits of joining a group trip with Projects Abroad? You will help on a local project where you can make a useful and long lasting contribution to a local community. You will learn new skills and make new friends from all over the world. You will add to your CV, have something to talk about in interviews and have a great time. Who have been on the programmes before? We have lots of experience working with different groups. To find out more you can read about previous group’s experiences at /group-experiences/. "The whole trip from beginning to end was a truly remarkable experience. All of the students from Ardingly enjoyed every moment (apart from perhaps sifting the worms out of manure!) and really hope that our contribution has made a difference"